External guidelines are critical in the design process, needed to assure alignment among all parties involved in your sales efforts. The development and use of a Creative Brief can be an extremely valuable tool in achieving message consistency and clarity. Why Use a Creative Brief? Creative briefs specify the audience, material requirements, brand positioning and process for creating sales collateral. At Atomic Revenue, our creative brief involves an extensive checklist focused on input from both the marketing and sales teams to ensure alignment and mutually beneficial message value in developing collateral for our clients. Sales collateral is only valuable if it is used effectively by the sales team — no one needs or wants an inventory of aging sales collateral collecting dust in a storage room. 1. Is the collateral complex? Sales collateral is not intended to answer every question a client may ask; collateral should generate interest, and establish your organization as a resource to address client problems and pains. Simple is best. 2. Does the collateral take the customer on the intended “buying journeys”? Sales collateral is PART of the process, it is not the ENTIRE process. Match the collateral to its role/need at a specific point in the customer decision journey. 3. Does the collateral communicate what it means to the buyer to have your product/service offering? Your sales collateral is not about you and WHAT you do; your sales collateral must be about your prospective customer and WHY and HOW they will benefit from working with you. 4. Is the language of the collateral open to interpretation? Sales collateral must be able to stand on its own — in most instances, you will not be there to clarify if they have questions. It may be clear to you, but this is your brand and business; use others as proofreaders to ensure your message delivers the intended response. 5. How will a salesperson use this? Write, design, print, and hope is no way to develop your collateral materials; understand from the very beginning how and when the piece will be used, THEN design and develop to meet that particular situation. P.S. We do extensive research and validation on this. 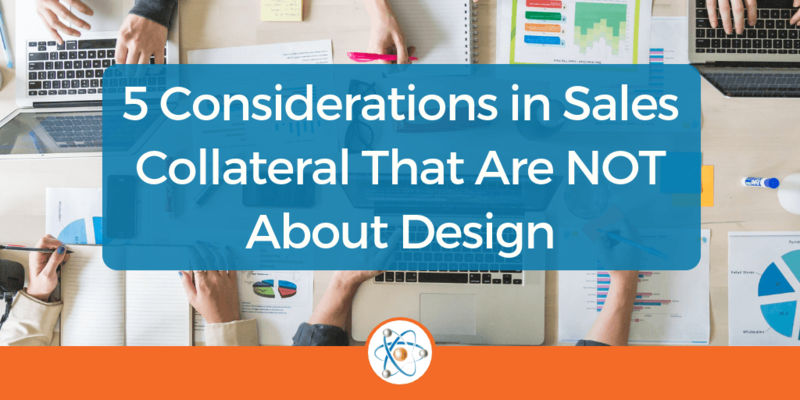 Yes, the design is very important, but getting the content right is where so many organizations fail; it is content-focus that is critical to the sales collateral creation process. A picture is still worth a thousand words (and a video can be worth tens of thousands), but note that the “currency” is in the words/content. Your sales collateral return-on-investment (ROI) is dependent on proper content, delivery, and utilization. Paired with outstanding content, impactful graphic design can progress an extremely powerful message that resonates with a buyer. Paired with poor or confusing content, impressive graphic design can dramatically amplify a poor message and potentially stop sales dead in their tracks. The collateral design is an extensive process to do right. But the difference it can make to advancing the sales effort is priceless.